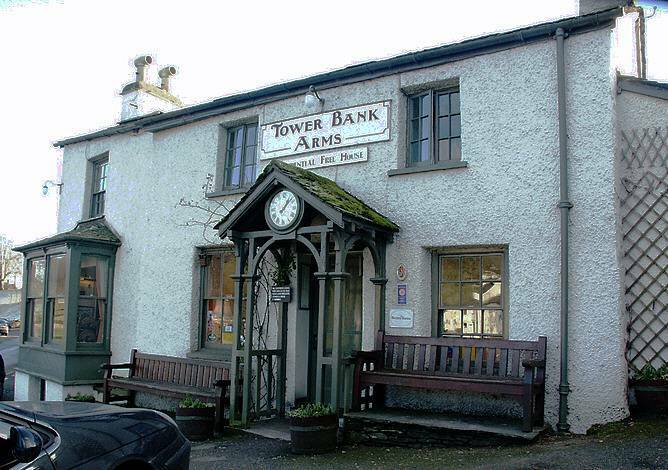 Near Sawrey is situated 2 miles south of Hawskhead on the B5285. From Bowness you can take the car ferry across Lake Windermere or head for Newby Bridge and drive up the west shore of Lake Windermere. The pub is very welcoming and is next door to Hill Top Farm, home to Beatrix Potter and the setting for all those children's stories. The 17th century Tower Bank Arms is an imposing pub from the front, mainly due to it being raised from the road. The pub has been carefully modernised so it has lost none of its period charm. It usually gathers walking, golfers and sailors in its bright light wood furnished interior. The bar area particularly has a lot of signed photos of celebs who have stayed there. The beers on at the time of visit were standards but there was a guest from the Hawkshead Brewery There is also a wide selection of bottled continental beers. The Tower is also a quiet pub with no music to spoil your enjoyment. Food (bar food and dining room) is served both lunch and evening and is good quality, though a little on the tourist side price wise - well it is owned by the National Trust. Nonetheless, it is well cooked and presented. There is accommodation here with three rooms, two with double beds and the other with twins - all are en-suite. Also try Far Sawrey.